"Temujin" redirects here. For the video game, see Temüjin (video game). Genghis Khan[note 3] (born Temüjin,[note 4] c. 1162 – August 18, 1227, Modern Mongolian pronunciation [ˈt͡ɕʰiŋɡɪs χaːɴ], Middle Mongol pronunciation [ˈt͡ɕʰiŋːɡɪs ˈkaχaːn] or [ˈt͡ʃʰiŋːɡɪs ˈqaχaːn]) was the founder and first Great Khan of the Mongol Empire, which became the largest contiguous empire in history after his death. He came to power by uniting many of the nomadic tribes of Northeast Asia. After founding the Empire and being proclaimed "Genghis Khan", he launched the Mongol invasions that conquered most of Eurasia. Campaigns initiated in his lifetime include those against the Qara Khitai, Caucasus, and Khwarazmian, Western Xia and Jin dynasties. These campaigns were often accompanied by large-scale massacres of the civilian populations – especially in the Khwarazmian and Western Xia controlled lands. By the end of his life, the Mongol Empire occupied a substantial portion of Central Asia and China. Beyond his military accomplishments, Genghis Khan also advanced the Mongol Empire in other ways. He decreed the adoption of the Uyghur script as the Mongol Empire's writing system. He also practiced meritocracy and encouraged religious tolerance in the Mongol Empire, and unified the nomadic tribes of Northeast Asia. Present-day Mongolians regard him as the founding father of Mongolia. Genghis Khan's father, Yesügei (leader of the Borjigin clan and nephew to Ambaghai and Hotula Khan), emerged as the head of the ruling Mongol clan. This position was contested by the rival Tayichi'ud clan, who descended directly from Ambaghai. When the Tatars grew too powerful after 1161, the Jin switched their support from the Tatars to the Keraites. Little is known about Genghis Khan's early life, due to the lack of contemporary written records. The few sources that give insight into this period often contradict. 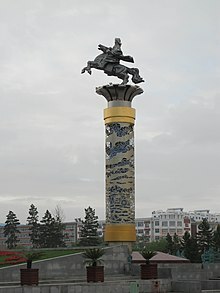 Genghis Khan's birth name, Temüjin, was derived from the Mongol word temür meaning "of iron", while jin denotes agency. Temüjin thus means "blacksmith". 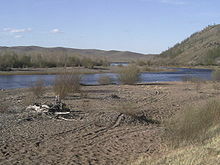 Genghis Khan was probably born in 1162 in Delüün Boldog, near the mountain Burkhan Khaldun and the rivers Onon and Kherlen in modern-day northern Mongolia, close to the current capital Ulaanbaatar. The Secret History of the Mongols reports that Temüjin was born grasping a blood clot in his fist, a traditional sign that he was destined to become a great leader. He was the second son of his father Yesügei who was a Kiyad chief prominent in the Khamag Mongol confederation and an ally of Toghrul of the Keraite tribe. Temüjin was the first son of his mother Hoelun. According to the Secret History, Temüjin was named after the Tatar chief Temüjin-üge whom his father had just captured. As previously arranged by his father, Temüjin married Börte of the Onggirat tribe in order to cement alliances between their two tribes. Soon after the marriage, Börte was kidnapped by the Merkits and reportedly given away as a wife. Temüjin rescued her with the help of his friend and future rival, Jamukha, and his protector, Toghrul of the Keraite tribe. She gave birth to a son, Jochi (1182–1227), nine months later, clouding the issue of his parentage. Despite speculation over Jochi, Börte would be Temüjin's only empress, though he did follow tradition by taking several morganatic wives. Börte had three more sons, Chagatai (1183–1242), Ögedei (1186–1241), and Tolui (1191–1232). Genghis later took about 500 secondary wives and "consorts", but Börte continued to be his life companion. He had many other children with those other wives, but they were excluded from succession, only Börte's sons being considered to be his heirs. However, a Tatar woman named Yisui, taken as a wife when her people were conquered by the Mongols, eventually came to be given almost as much prominence as Börte, despite originally being only one of his minor wives. The names of at least six daughters are known, and while they played significant roles behind the scenes during his lifetime, no documents have survived that definitively provide the number or names of daughters born to the consorts of Genghis Khan. 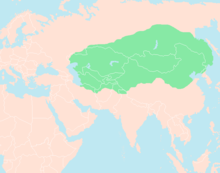 In the early 12th century, the Central Asian plateau north of China was divided into several tribes of confederation, including Naimans, Merkits, Tatars, Khamag Mongols, and Keraites, that were all prominent and often unfriendly toward each other, as evidenced by random raids, revenge attacks, and plundering. As Jamukha and Temüjin drifted apart in their friendship, each began consolidating power, and they became rivals. Jamukha supported the traditional Mongolian aristocracy, while Temüjin followed a meritocratic method, and attracted a broader range and lower class of followers. Following his earlier defeat of the Merkits, and a proclamation by the shaman Kokochu that the Eternal Blue Sky had set aside the world for Temüjin, Temüjin began rising to power. In 1186, Temüjin was elected khan of the Mongols. Threatened by this rise, Jamukha attacked Temujin in 1187 with an army of 30,000 troops. Temüjin gathered his followers to defend against the attack, but was decisively beaten in the Battle of Dalan Balzhut. However, Jamukha horrified and alienated potential followers by boiling 70 young male captives alive in cauldrons. Toghrul, as Temüjin's patron, was exiled to the Qara Khitai. The life of Temüjin for the next 10 years is unclear, as historical records are mostly silent on that period. Around the year 1197, the Jin initiated an attack against their formal vassal, the Tatars, with help from the Keraites and Mongols. Temüjin commanded part of this attack, and after victory, he and Toghrul were restored by the Jin to positions of power. The Jin bestowed Toghrul with the honorable title of Ong Khan, and Temüjin with a lesser title of j'aut quri. Senggum, son of Toghrul (Wang Khan), envied Genghis Khan's growing power and affinity with his father. He allegedly planned to assassinate Genghis Khan. Although Toghrul was allegedly saved on multiple occasions by Genghis Khan, he gave in to his son and became uncooperative with Genghis Khan. Genghis Khan learned of Senggum's intentions and eventually defeated him and his loyalists. One of the later ruptures between Genghis Khan and Toghrul was Toghrul's refusal to give his daughter in marriage to Jochi, Genghis Khan's first son. This was disrespectful in Mongolian culture and led to a war. Toghrul allied with Jamukha, who already opposed Genghis Khan's forces. However, the dispute between Toghrul and Jamukha, plus the desertion of a number of their allies to Genghis Khan, led to Toghrul's defeat. Jamukha escaped during the conflict. This defeat was a catalyst for the fall and eventual dissolution of the Keraite tribe. The next direct threat to Genghis Khan was the Naimans (Naiman Mongols), with whom Jamukha and his followers took refuge. The Naimans did not surrender, although enough sectors again voluntarily sided with Genghis Khan. In 1201, a khuruldai elected Jamukha as Gür Khan, "universal ruler", a title used by the rulers of the Qara Khitai. Jamukha's assumption of this title was the final breach with Genghis Khan, and Jamukha formed a coalition of tribes to oppose him. Before the conflict, several generals abandoned Jamukha, including Subutai, Jelme's well-known younger brother. After several battles, Jamukha was turned over to Genghis Khan by his own men in 1206. According to the Secret History, Genghis Khan again offered his friendship to Jamukha. Genghis Khan had killed the men who betrayed Jamukha, stating that he did not want disloyal men in his army. Jamukha refused the offer, saying that there can only be one sun in the sky, and he asked for a noble death. The custom was to die without spilling blood, specifically by having one's back broken. Jamukha requested this form of death, although he was known to have boiled his opponents' generals alive. The part of the Merkit clan that sided with the Naimans were defeated by Subutai, who was by then a member of Genghis Khan's personal guard and later became one of Genghis Khan's most successful commanders. The Naimans' defeat left Genghis Khan as the sole ruler of the Mongol steppe – all the prominent confederations fell or united under his Mongol confederation. As a result, by 1206, Genghis Khan had managed to unite or subdue the Merkits, Naimans, Mongols, Keraites, Tatars, Uyghurs, and other disparate smaller tribes under his rule. This was a monumental feat. It resulted in peace between previously warring tribes, and a single political and military force. The union became known as the Mongols. At a Khuruldai, a council of Mongol chiefs, Genghis Khan was acknowledged as Khan of the consolidated tribes and took the new title "Genghis Khan". The title Khagan was conferred posthumously by his son and successor Ögedei who took the title for himself (as he was also to be posthumously declared the founder of the Yuan dynasty). Genghis Khan was a Tengrist, but was religiously tolerant and interested in learning philosophical and moral lessons from other religions. He consulted Buddhist monks (including the Zen monk Haiyun), Muslims, Christian missionaries, and the Taoist monk Qiu Chuji. According to the Fozu Lidai Tongzai written by Nian Chang (b. 1282) Genghis Khan's viceroy Muqali was pacifying Shanxi in 1219, the homeland of Zen Buddhist monk Haiyun (海雲, 1203-1257), when one of Muqali's Chinese generals, impressed with Haiyun and his master Zhongguan's demeanor, recommended them to Muqali. Muqali then reported on the two to Genghis Khan who issued the following decree on their behalf: "They truly are men who pray to Heaven. I should like to support them with clothes and food and make them chiefs. I'm planning on gathering many of this kind of people. While praying to Heaven, they should not have difficulties imposed on them. To forbid any mistreatment, they will be authorized to act as darqan (possessor of immunity)." Genghis Khan had already met Haiyun in 1214 and been impressed by his reply refusing to grow his hair in the Mongol hairstyle and allowed him to keep his head shaven. After the death of his master Zhongguan in 1220, Haiyun became the head of the Chan (Chinese Zen) school during Genghis Khan's rule and was repeatedly recognized as the chief monk in Chinese Buddhism by subsequent Khans until 1257 when he was succeeded as chief monk by another Chan master Xueting Fuyu the Mongol-appointed abbot of Shaolin monastery. Genghis Khan summoned and met the Daoist master Qiu Chuji (1148-1227) in Afghanistan in 1222. He thanked Qiu Chuji for accepting his invitation and asked if Qiu Chuji had brought the medicine of immortality with him. Qiu Chuji said there was no such thing as a medicine of immortality but that life can be extended through abstinence. Genghis Khan appreciated his honest reply and asked Qiu Chuji who it is that calls him eternal heavenly man, he himself or others. After Qiu Chuji replied that others call him by that name Genghis Khan decreed that from thenceforth Qiu Chuji should be called "Immortal" and appointed him master of all monks in China, noting that heaven had sent Qiu Chuji to him. Qiu Chuji died in Beijing the same year as Genghis Khan and his shrine became the White Cloud Temple. Following Khans continued appointing Daoist masters of the Quanzhen School at White Cloud Temple. The Daoists lost their privilege in 1258 after the Great Debate organized by Genghis Khan's grandson Mongke Khan when Chinese Buddhists (led by the Mongol-appointed abbot or shaolim zhanglao of Shaolin monastery), Confucians and Tibetan Buddhists allied against the Daoists. Kublai Khan was appointed to preside over this debate (in Shangdu/Xanadu, the third meeting after two debates in Karakorum in 1255 and 1256) in which 700 dignitaries were present. Kublai Khan had already met Haiyun in 1242 and been swayed towards Buddhism. Genghis Khan's decree exempting Daoists (xiansheng), Buddhists (toyin), Christians (erke'üd) and Muslims (dashmad) from tax duties were continued by his successors until the end of the Yuan dynasty in 1368. All the decrees use the same formula and state that Genghis Khan first gave the decree of exemption. 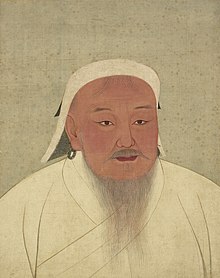 Kublai Khan's 1261 decree in Mongolian appointing the elder of the Shaolin monastery uses the same formula and states "Činggis qan-u jrlg-tur toyid erkegü:d šingšingü:d dašmad aliba alba gubčiri ülü üjen tngri-yi jalbariju bidan-a irüge:r ögün atugai keme:gsen jrlg-un yosuga:r...ene Šaolim janglau-da bariju yabuga:i jrlg ögbei" (According to the decree of Genghis Khan which says may the Buddhists, Christians, Daoists and Muslims be exempt from all taxation and may they pray to God and continue offering us blessings...I have given this decree to the Shaolin elder to carry it). According to Juvaini, Genghis Khan allowed religious freedom to Muslims during his conquest of Khwarezmia "permitting the recitation of the takbir and the azan". However, Rashid-al-Din states there were occasions when Genghis Khan forbade Halal butchering. Kublai Khan revived the decree in 1280 after Muslims refused to eat at a banquet. He forbade Halal butchering and circumcision. The decree of Kublai Khan was revoked after a decade. Genghis Khan met Wahid-ud-Din in Afghanistan in 1221 and asked him if the prophet Muhammad predicted a Mongol conqueror. He was initially pleased with Wahid-ud-Din but then dismissed him from his service saying "I used to consider you a wise and prudent man, but from this speech of yours, it has become evident to me that you do not possess complete understanding and that your comprehension is but small". With such a small force, the invading Mongols were forced to change strategies and resort to inciting internal revolt among Kuchlug's supporters, leaving the Qara Khitai more vulnerable to Mongol conquest. As a result, Kuchlug's army was defeated west of Kashgar. Kuchlug fled again, but was soon hunted down by Jebe's army and executed. By 1218, as a result of the defeat of Qara Khitai, the Mongol Empire and its control extended as far west as Lake Balkhash, which bordered Khwarazmia, a Muslim state that reached the Caspian Sea to the west and Persian Gulf and the Arabian Sea to the south. In the early 13th century, the Khwarazmian dynasty was governed by Shah Ala ad-Din Muhammad. Genghis Khan saw the potential advantage in Khwarazmia as a commercial trading partner using the Silk Road, and he initially sent a 500-man caravan to establish official trade ties with the empire. However, Inalchuq, the governor of the Khwarazmian city of Otrar, attacked the caravan, claiming that the caravan contained spies and therefore was a conspiracy against Khwarazmia. The situation became further complicated because the governor later refused to make repayments for the looting of the caravans and hand over the perpetrators. Genghis Khan then sent a second group of three ambassadors (two Mongols and a Muslim) to meet the Shah himself, instead of the governor Inalchuq. The Shah had all the men shaved and the Muslim beheaded and sent his head back with the two remaining ambassadors. Outraged, Genghis Khan planned one of his largest invasion campaigns by organizing together around 100,000 soldiers (10 tumens), his most capable generals and some of his sons. He left a commander and number of troops in China, designated his successors to be his family members and likely appointed Ögedei to be his immediate successor and then went out to Khwarazmia. In the meantime, Genghis Khan selected his third son Ögedei as his successor before his army set out, and specified that subsequent Khans should be his direct descendants. Genghis Khan had left Muqali, one of his most trusted generals, in command of all Mongol forces in Jin China while he battled the Khwarezmid Empire to the west. After the defeat of the Khwarazmian Empire in 1220, Genghis Khan gathered his forces in Persia and Armenia to return to the Mongolian steppes. Under the suggestion of Subutai, the Mongol army was split into two forces. Genghis Khan led the main army on a raid through Afghanistan and northern India towards Mongolia, while another 20,000 (two tumen) contingent marched through the Caucasus and into Russia under generals Jebe and Subutai. They pushed deep into Armenia and Azerbaijan. The Mongols defeated the kingdom of Georgia, sacked the Genoese trade-fortress of Caffa in Crimea and overwintered near the Black Sea. Heading home, Subutai's forces attacked the allied forces of the Cuman–Kipchaks and the poorly coordinated 80,000 Kievan Rus' troops led by Mstislav the Bold of Halych and Mstislav III of Kiev who went out to stop the Mongols' actions in the area. Subutai sent emissaries to the Slavic princes calling for a separate peace, but the emissaries were executed. At the Battle of Kalka River in 1223, Subutai's forces defeated the larger Kievan force. They may have been defeated by the neighbouring Volga Bulgars at the Battle of Samara Bend. There is no historical record except a short account by the Arab historian Ibn al-Athir, writing in Mosul some 1100 miles away from the event. Various historical secondary sources – Morgan, Chambers, Grousset – state that the Mongols actually defeated the Bulgars, Chambers even going so far as to say that the Bulgars had made up stories to tell the (recently crushed) Russians that they had beaten the Mongols and driven them from their territory. The Russian princes then sued for peace. Subutai agreed but was in no mood to pardon the princes. As was customary in Mongol society for nobility, the Russian princes were given a bloodless death. Subutai had a large wooden platform constructed on which he ate his meals along with his other generals. Six Russian princes, including Mstislav III of Kiev, were put under this platform and crushed to death. Genghis Khan was aware of the friction between his sons (particularly between Chagatai and Jochi) and worried of possible conflict between them if he died. He therefore decided to divide his empire among his sons and make all of them Khan in their own right, while appointing one of his sons as his successor. Chagatai was considered unstable due to his temper and rash behavior, because of statements he made that he would not follow Jochi if he were to become his father's successor. Tolui, Genghis Khan's youngest son, was not suitable since in Mongol culture, youngest sons were not given much responsibility due to their age. If Jochi were to become successor, it was likely that Chagatai would engage in warfare with him and collapse the empire. Therefore, Genghis Khan decided to give the throne to Ögedei. Ögedei was seen by Genghis Khan as dependable in character and relatively stable and down to earth and would be a neutral candidate that might defuse the situation between his brothers. Jochi died in 1226, during his father's lifetime. Some scholars, notably Ratchnevsky, have commented on the possibility that Jochi was secretly poisoned by an order from Genghis Khan. 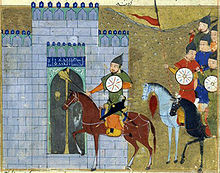 Rashid al-Din reports that the great Khan sent for his sons in the spring of 1223, and while his brothers heeded the order, Jochi remained in Khorasan. Juzjani suggests that the disagreement arose from a quarrel between Jochi and his brothers in the siege of Urgench. Jochi had attempted to protect Urgench from destruction, as it belonged to territory allocated to him as a fief. He concludes his story with the clearly apocryphal statement by Jochi: "Genghis Khan is mad to have massacred so many people and laid waste so many lands. I would be doing a service if I killed my father when he is hunting, made an alliance with Sultan Muhammad, brought this land to life and gave assistance and support to the Muslims." Juzjani claims that it was in response to hearing of these plans that Genghis Khan ordered his son secretly poisoned; however, as Sultan Muhammad was already dead by 1223, the accuracy of this story is questionable. Modern Mongolian historians say that towards the end of his life, Genghis Khan attempted to create a civil state under the Great Yassa that would have established the legal equality of all individuals, including women. However, there is no evidence of this, or of the lifting of discriminatory policies towards sedentary peoples such as the Chinese. Women played a relatively important role in the Mongol Empire and in the family, for example Töregene Khatun was briefly in charge of the Mongol Empire while the next male leader Khagan was being chosen. Modern scholars refer to the alleged policy of encouraging trade and communication as the Pax Mongolica (Mongol Peace). Several years before his death, Genghis Khan divided his empire among his sons Ögedei, Chagatai, Tolui, and Jochi (Jochi's death several months before Genghis Khan's meant that his lands were instead split between his sons, Batu and Orda) into several Khanates designed as sub-territories: their Khans were expected to follow the Great Khan, who was, initially, Ögedei. Contrary to popular belief, Genghis Khan did not conquer the whole area of the eventual Mongol Empire. At the time of his death in 1227, the empire stretched from the Caspian Sea to the Sea of Japan. Its expansion continued for one or more generations. Under Genghis's successor Ögedei Khan the speed of expansion reached its peak. 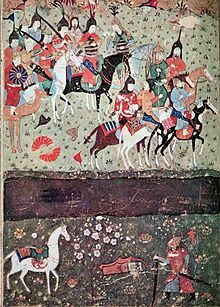 Mongol armies pushed into Persia, finished off the Western Xia and the remnants of the Khwarezmids, clashed with the imperial Song dynasty of China, and eventually took control of all of China in 1279. They also pushed further into Russia and eastern Europe. Genghis Khan is credited with bringing the Silk Road under one cohesive political environment. This allowed increased communication and trade between the West, Middle East and Asia, thus expanding the horizons of all three cultural areas. Some historians have noted that Genghis Khan instituted certain levels of meritocracy in his rule, was tolerant of religions and explained his policies clearly to all his soldiers. As of 2012[update], Elbegdorj issued a decree establishing Genghis Khan's birthday as a national holiday on the first day of winter (according to the Mongolian lunar calendar). Japanese such as Kenchō Suyematsu have claimed that the ethnic Japanese Minamoto no Yoshitsune was Genghis Khan. In Inner Mongolia there are a monument and buildings dedicated to him and considerable number of ethnic Mongols in the area with a population of around 5 million, almost twice the population of Mongolia. 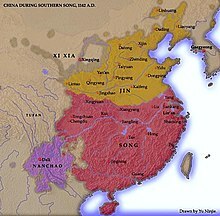 While Genghis never conquered all of China, his grandson Kublai Khan completed that conquest and established the Yuan dynasty that is often credited with re-uniting China. There has been much artwork and literature praising Genghis as a military leader and political genius. The Mongol-established Yuan dynasty left an indelible imprint on Chinese political and social structures for subsequent generations with literature during the preceding Jin dynasty relatively fewer. The invasions of Merv, Samarkand, Urgench, Nishapur, Bamyan, Balkh and Herat among others caused mass murders, such as when large portions of Khorasan Province were completely destroyed. His descendant Hulagu Khan destroyed much of Iran's north and sacked Baghdad, although his forces were halted by the Mamluks of Egypt. Hulagu's descendant Ghazan Khan once returned to beat the Mamluks and briefly gain the control of Syria, but were eventually defeated. According to the works of the Persian historian Rashid-al-Din Hamadani, the Mongols killed more than 70,000 people in Merv and more than 190,000 in Nishapur. In 1237, Batu Khan, a grandson of Genghis Khan, launched an invasion into Kievan Rus'. Over the course of three years, the Mongols annihilated all of the major cities of Eastern Europe with the exception of Novgorod and Pskov. They [the Mongols] attacked Russia, where they made great havoc, destroying cities and fortresses and slaughtering men; and they laid siege to Kiev, the capital of Russia; after they had besieged the city for a long time, they took it and put the inhabitants to death. When we were journeying through that land we came across countless skulls and bones of dead men lying about on the ground. Kiev had been a very large and thickly populated town, but now it has been reduced almost to nothing, for there are at the present time scarce two hundred houses there and the inhabitants are kept in complete slavery. In addition to most of the Mongol nobility up to the 20th century, the Mughal emperor Babur's mother was a descendant. Timur (also known as Tamerlane), the 14th-century military leader, and many other nobilities of central Asian countries claimed descent from Genghis Khan. During the Soviet purge most of the Mongol nobility in Mongolia were purged. Genghis Khan a 1965 film starring Omar Sharif. Under The Eternal Blue Sky, a Mongolian film directed by Baljinnyam, which was released in 1990. Starring Agvaantserengiin Enkhtaivan as Temüjin. Genghis Khan, an unfinished 1992 film starring Richard Tyson, Charlton Heston and Pat Morita. Genghis Khan – A Proud Son Of Heaven, a 1998 film made in Mongolian, with English subtitles. No Right to Die – Chinggis Khaan, a Mongolian film released in 2008. Genghis Khan makes a cameo in Suicide Squad: Hell to Pay as one of the many names which Vandal Savage adopted in history. During an interview, the directors of Avengers: Infinity War had compared the film's antagonist Thanos with Genghis Khan for his purpose to eliminate half of the Universe. "The Squire's Tale", one of The Canterbury Tales by Geoffrey Chaucer, is set at the court of Genghis Khan. West German pop band Dschinghis Khan took its name from the German-language spelling of Genghis Khan, "Dschingis Khan". They participated in the Eurovision Song Contest 1979 with their song of the same name. The artist Miike Snow released the song "Genghis Khan" in 2017. One theory suggests the name stems from a palatalised version of the Mongolian and Turkic word tenggis, meaning "ocean", "oceanic" or "wide-spreading". (Lake Baikal and ocean were called tenggis by the Mongols. However, it seems that if they had meant to call Genghis tenggis they could have said, and written, "Tenggis Khan", which they did not.) Zhèng (Chinese: 正) meaning "right", "just", or "true", would have received the Mongolian adjectival modifier -s, creating "Jenggis", which in medieval romanization would be written "Genghis". It is likely that the 13th-century Mongolian pronunciation would have closely matched "Chinggis". According to the Secret History of the Mongols, Temüjin was named after a powerful warrior of the Tatar tribe that his father Yesügei had taken prisoner. The name "Temüjin" is believed to derive from the word temür, Turkic for iron (modern Mongolian: төмөр, tömör). The name would imply a blacksmith or a man strong like iron. Genghis Khan is spelled in variety of ways in different languages such as Mongolian Chinggis Khaan, English Chinghiz, Chinghis, and Chingiz, Chinese: 成吉思汗; pinyin: Chéngjísī Hán, Turkic: Cengiz Han, Çingiz Xan, Çingiz Han, Chingizxon, Çıñğız Xan, Chengez Khan, Chinggis Khan, Chinggis Xaan, Chingis Khan, Jenghis Khan, Chinggis Qan, Djingis Kahn, Russian: Чингисхан (Čingiskhan) or Чингиз-хан (Čingiz-khan), etc. Temüjin is written in Chinese as simplified Chinese: 铁木真; traditional Chinese: 鐵木眞; pinyin: Tiěmùzhēn. 1227: Genghis Khan died after conquering the Tangut people. Cause of death is uncertain. 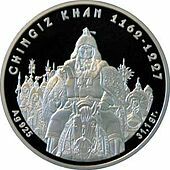 ^ Historians of the Mongol empire generally prefer the spelling "Chinggis Khaan", which more closely approximates the name in Mongolian, Чингис хаан [t͡ʃʰiŋɡɪs xaːŋ] ( listen).The English spelling of his name came originally from Italian, which combined with the original rendering "Chinggis" means that the first G should be soft, and therefore the pronunciation /ˈdʒɛŋɡɪs ˈkɑːn/ is more similar to the Italian; the second G has a following H to make it hard, as in "spaghetti". But because G before E in English is ambiguous (cf. "get" vs. "gel"), this leads to the common pronunciation of /ˈɡɛŋɡɪs ˈkɑːn/, with both G's hard, which has led to an alternate spelling "Jenghis Khan" to try to prevent this. ^ Sometimes also written in English as "Temuchin" or "Temujin". ^ "Central Asiatic Journal". Central Asiatic Journal. 5: 239. 1959. Retrieved July 29, 2011. ^ a b Rashid al-Din asserts that Genghis Khan was born in 1155, while the Yuanshi (元史, History of the Yuan dynasty) records his year of birth as 1162. According to Ratchnevsky, accepting a birth in 1155 would render Genghis Khan a father at the age of 30 and would imply that he personally commanded the expedition against the Tanguts at the age of 72. Also, according to the Altan Tobci, Genghis Khan's sister, Temülin, was nine years younger than he; but the Secret History relates that Temülin was an infant during the attack by the Merkits, during which Genghis Khan would have been 18, had he been born in 1155. Zhao Hong reports in his travelogue that the Mongols he questioned did not know and had never known their ages. ^ Ratchnevsky, Paul (1991). Genghis Khan: His Life and Legacy. Blackwell Publishing. p. 142. ISBN 978-0-631-16785-3. It is possible, however, to say with certainty that Genghis Khan died in August 1227; only in specifying the actual day of his death do our sources disagree. ^ Morgan, David (2007). The Mongols (2 ed.). Blackwell Publishing. p. 186. ISBN 978-1-4051-3539-9. "Genghis Khan" at American Heritage Dictionary of the English Language online. "Genghis Khan". Webster's New World College Dictionary. Wiley Publishing. 2004. Retrieved July 29, 2011. "Genghis Khan". Oxford Dictionaries Online. Oxford University Press. 2011. Retrieved July 29, 2011. ^ Saunders, John Joseph (2001) [First published 1972]. History of the Mongol Conquests. Philadelphia: University of Pennsylvania Press. ISBN 978-0-8122-1766-7. ^ John Man (2004). Genghis Khan: Life, Death, and Resurrection (reprint, illustrated ed.). Bantam. pp. 254–55. ISBN 978-0-312-36624-7. Retrieved May 17, 2014. ^ "Genghis Khan". North Georgia College and State University. Archived from the original on March 6, 2010. Retrieved January 26, 2010. ^ Ratchnevsky, Paul (1991). Genghis Khan: His Life and Legacy. Blackwell Publishing. pp. 9–10. ISBN 978-0-631-16785-3. ^ Campbell, Mike. "Meaning, origin and history of the name Temujin". Behind the Name. Retrieved March 29, 2016. ^ Glasse, Cyril; Smith, Huston (January 2003). The New Encyclopedia of Islam. p. 313. ISBN 978-0-7591-0190-6. ^ Morgan, David (1990). The Mongols (Peoples of Europe). p. 58. ^ Kahn, Paul (adaptor) (1998). Secret History of the Mongols: The Origin of Chingis Khan (expanded edition): An Adaptation of the Yüan chʾao pi shih, Based Primarily on the English Translation by Francis Woodman Cleaves. Asian Culture Series. Boston: Cheng & Tsui Co. p. 192. ISBN 978-0-88727-299-8. ^ "Redefining Your Circumstances: Genghis Khan's Rise to Ruler of the World". Man of 300. 2018-03-17. Retrieved March 29, 2018. ^ a b Weatherford, Jack (March 22, 2005). Genghis Khan and the Making of the Modern World. p. 23. ISBN 978-0-307-23781-1. Retrieved December 16, 2014. ^ "Genghis Khan Biography (1162/7)". The Biography Channel. Archived from the original on July 16, 2009. Retrieved May 20, 2008. ^ Weatherford, Jack (2010). The Secret History of the Mongol Queens: How the Daughters of Genghis Khan Rescued His Empire. New York: Crown Publishing Group. pp. xiii, 2. ^ Grousset, Rene (1944). Conqueror of the World: The Life of Chingis-khagan. New York: Viking Press. ^ Weatherford, Jack (2005). Genghis Khan and the Making of the Modern World. Crown. ISBN 978-0-307-23781-1. ^ Biran, Michal (2012). Genghis Khan. London: Oneworld Publications. p. 35. ISBN 978-1-78074-204-5. ^ a b Weatherford, Jack (2004). "2: Tale of Three Rivers". Genghis Khan and the Making of the Modern World. Three Rivers Press. p. 44. ISBN 978-0-609-80964-8. ^ a b Man, John (2004). Genghis Khan: Life, Death and Resurrection. London; New York: Bantam Press. ISBN 978-0-593-05044-6. ^ Eskildsen, Stephen (2004). The Teachings and Practices of the Early Quanzhen Taoist Masters. SUNY Press. p. 17. ISBN 978-0-7914-6045-0. ^ a b "Central Asian world cities Archived January 18, 2012, at the Wayback Machine", University of Washington. ^ Morgan, David (1986). The Mongols. The Peoples of Europe. Blackwell Publishing. ISBN 978-0-631-17563-6. ^ "Ogedei died at the age of 56 by Chinese historical standards (55 by modern western standards) in 1241, meaning he was born in 1186"
^ Emmons, James B. (2012). Li, Xiaobing, ed. Genghis Khan. China at War: An Encyclopedia. Santa Barbara, California: ABC-CLIO. p. 139. ISBN 978-1-59884-415-3. Retrieved August 21, 2013. ^ Hart-Davis, Adam (2007). History: From the Dawn of Civilization to the Present Day. London: Dorling Kindersley. p. 165. ISBN 978-1-4053-1809-9. ^ Man, John (2004). Genghis Khan: Life, Death, and Resurrection. New York City: St. Martin's Press. pp. 239–240. ISBN 978-0-312-36624-7. ^ Lange, Brenda (2003). Genghis Khan. New York City: Infobase Publishing. p. 71. ISBN 978-0-7910-7222-6. ^ Heissig, Walther (1964). Die Mongolen. Ein Volk sucht seine Geschichte. Düsseldorf. p. 124. ^ Man (2004), pp. 329–333. ^ Man (2004), p. 338. 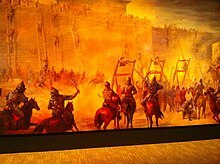 ^ "Palace of Genghis Khan unearthed". BBC. October 7, 2004. Retrieved May 20, 2008. ^ Pocha, Jehangir S. (May 10, 2005). "Mongolia sees Genghis Khan's good side". International Herald Tribune. Retrieved May 20, 2008. ^ Clive Foss, The Tyrants, page 57, Quercus, London, 2007. ^ Christopher Kaplonski: The case of the disappearing Chinggis Khaan. ^ Griffiths, Daniel (January 11, 2007). "Asia-Pacific | Post-communist Mongolia's struggle". BBC News. Retrieved August 3, 2009. ^ "Business | Genghis Khan may get protection". BBC News. October 6, 2006. Retrieved August 3, 2009. ^ "ASIA-PACIFIC | Mongolia glorifies Genghis Khan". BBC News. May 3, 2002. Retrieved August 3, 2009. ^ "The Yasa of Chingis Khan". Retrieved February 16, 2010. ^ "Speech of President Elbegdorj at introduction of Partnering Against Corruption Initiative". Office of the President of Mongolia. March 3, 2011. Retrieved August 1, 2013. ^ "Speech by Tsakhiagiin Elbegdorj, President of Mongolia at a solemn assembly, dedicated to the 850th anniversary of birth of Chinggis Khaan". Office of the President of Mongolia. November 14, 2012. Retrieved June 21, 2013. ^ "Mongolia to celebrate the birthday of Great Chinggis Khaan". InfoMongolia.com. Archived from the original on October 14, 2013. Retrieved October 12, 2013. ^ "The Legacy of Genghis Khan" at Los Angeles County Museum of Art—again. ^ R. Ward, Steven (2009). Immortal: a military history of Iran and its armed forces. Georgetown University Press. p. 39. ISBN 978-1-58901-258-5. ^ Zerjal, T; Xue, Y; Bertorelle, G; Wells, RS; Bao, W; Zhu, S; Qamar, R; Ayub, Q; Mohyuddin, A (2003). "The Genetic Legacy of the Mongols". The American Journal of Human Genetics. 72 (3): 717–721. doi:10.1086/367774. PMC 1180246. PMID 12592608. ^ Genetics: Analysis Of Genes And Genomes by Daniel L. Hartl, Elizabeth W. Jones, p. 309. ^ "History of Russia". Archived from the original on January 21, 2010. ^ "The Destruction of Kiev". Tspace.library.utoronto.ca. Archived from the original on May 30, 2012. Retrieved October 12, 2013. ^ "Phoenix From the Ashes: A Tale of the Book in Iran". December 14, 2007. Archived from the original on December 14, 2007. Retrieved October 12, 2013. ^ "Civilizations: How we see others, how others see us". Unesco.org. Archived from the original on October 27, 2013. Retrieved October 12, 2013. ^ "Britannica". Encyclopædia Britannica, Inc.
^ Lister, R. P. (2000) [c1969]. Genghis Khan. Lanham, Maryland: Cooper Square Press. ISBN 978-0-8154-1052-2. ^ Timothy May. "Book Review". North Georgia College and State University. Archived from the original on October 10, 2007. Retrieved February 20, 2008. Hildinger, Erik (1997). Warriors Of The Steppe: Military History Of Central Asia, 500 BC To 1700 AD. Cambridge: De Capo Press. ISBN 978-0-7867-3114-5. Lane, George (2004). Genghis Khan and Mongol Rule. Westport, Connecticut: Greenwood Publishing Group. ISBN 978-0-313-32528-1. Man, John (2004). Genghis Khan: Life, Death and Resurrection. London; New York: Bantam Press. ISBN 978-0-593-05044-6. Ratchnevsky, Paul (1991). Genghis Khan: His Life and Legacy [Čingis-Khan: sein Leben und Wirken]. tr. & ed. Thomas Nivison Haining. Oxford, UK; Cambridge, Massachusetts, US: B. Blackwell. ISBN 978-0-631-16785-3. Brent, Peter (1976). The Mongol Empire: Genghis Khan: His Triumph and His Legacy. London: Weidenfeld & Nicolson. ISBN 978-0-297-77137-1. Farale, Dominique (2002). De Gengis Khan à Qoubilaï Khan : la grande chevauchée mongole. Campagnes & stratégies (in French). Paris: Economica. ISBN 978-2-7178-4537-2. Kennedy, Hugh (2002). Mongols, Huns & Vikings. London: Cassell. ISBN 978-0-304-35292-0. Lister, R. P. (2000). Genghis Khan. Lanham, Maryland: Cooper Square Press. ISBN 978-0-8154-1052-2. Man, John (1999). Gobi: Tracking the Desert. London; New Haven, Conn: Weidenfeld & Nicolson; Yale University Press. ISBN 978-0-7538-0161-1. May, Timothy (2001). "Mongol Arms". Explorations in Empire: Pre-Modern Imperialism Tutorial: The Mongols. San Antonio College History Department. Archived from the original on May 18, 2008. Retrieved May 22, 2008. Morgan, David (1986). The Mongols. The Peoples of Europe. Blackwell Publishing. ISBN 978-0-631-17563-6. Stevens, Keith. "Heirs to Discord: The Supratribal Aspirations of Jamukha, Toghrul, and Temüjin" at the Internet Archive PDF (72.1 KB) Retrieved May 22, 2008. Stewart, Stanley (2001). In the Empire of Genghis Khan: A Journey among Nomads. London: Harper Collins. ISBN 978-0-00-653027-5. Turnbull, Stephen (2003). Genghis Khan & the Mongol Conquests 1190–1400. Oxford: Osprey Publishing. ISBN 978-1-84176-523-5. Valentino, Benjamin A. (2004). Final Solutions: Mass Killing and Genocide in the Twentieth Century. Ithaca, N.Y.: Cornell University Press. ISBN 978-0-8014-3965-0. Juvaynī, Alā al-Dīn Atā Malik, 1226–1283 (1997). Genghis Khan: The History of the World-Conqueror [Tarīkh-i jahāngushā]. tr. John Andrew Boyle. Seattle: University of Washington Press. ISBN 978-0-295-97654-9. Rashid al-Din Tabib (1995). A Compendium of Chronicles: Rashid al-Din's Illustrated History of the World Jami' al-Tawarikh. The Nasser D. Khalili Collection of Islamic Art, Vol. XXVII. Sheila S. Blair (ed.). Oxford: Oxford University Press. ISBN 978-0-19-727627-3. Rashid al-Din Tabib (1971). The Successors of Genghis Khan (extracts from Jami' Al-Tawarikh). UNESCO Collection of Representative Works: Persian heritage series. tr. from the Persian by John Andrew Boyle. New York: Columbia University Press. ISBN 978-0-231-03351-0. The Secret History of the Mongols: A Mongolian Epic Chronicle of the Thirteenth Century [Yuan chao bi shi]. Brill's Inner Asian Library vol. 7. tr. Igor de Rachewiltz. Leiden; Boston: Brill. 2004. ISBN 978-90-04-13159-0. Why Genghis Khan was good for the planet. The Guardian. January 26, 2011.